Many people want to make their home look glamorous but struggle when it comes to designing their kitchen, even woodworking artists who design their own simple furniture, need some help. Finding the right mix of practical and glamorous can be difficult but the good news is that it is possible to achieve this. You can add things like some vinyl plank flooring that will work well in your kitchen or even swap out your worktops for a newer sparkly version. In this article, we are going to give you some tips on how you can make your kitchen more glamorous. Make sure to keep reading if you’d like to find out more about turning your kitchen into the best room in your home. One of the best ways that you can add some glamour to your kitchen is to add some chandeliers. You will love seeing these hang above your head as they light up your room. You don’t need to have crystal chandeliers if you can’t afford it, there are plenty of other glamorous options for those with a limited budget. If you have an island in your kitchen then you should think about installing these above it as this will make it stand out even more. 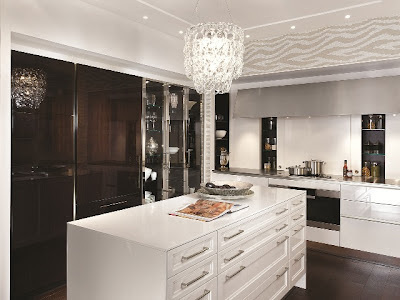 If you are trying to recreate a glamorous kitchen then you need to think about where you are going to add some sparkle. One of the best ways to add some sparkle is to get yourself one of the Black Glam sparkle laminate kitchen worktops. These worktops are easy to clean, and they will add total glamour to your kitchen. It is probably a good idea to change all of your worktops to this sparkly surface but if you want to make your island stand out then you could just make this the sparkling centerpiece. Don’t be afraid to add a bit of sparkle as this is only going to make your kitchen more glamorous. Everyone wants to have a nice wooden floor in their kitchen for that perfect glamorous look, but it is pretty impractical to get one of these installed. This is why you should think about getting some vinyl plank flooring which will work very well and won’t be affected by the conditions that your kitchen will create. You’ll love how glamorous your kitchen looks with your brand new vinyl plank flooring. Our next tip for those who want to make their kitchen more glamorous is to get some golden faucets installed. Think about how glam your kitchen sink would be with a nice faucet that leans over your sink and oozes class. On top of this, you should also think about changing up your handles on the cupboards and drawers and making them match the golden faucet. The more gold the better as this is the sign that something is in fact glamorous. Our final tip for transforming your kitchen into something glamorous is to add some open shelving. This is great for those who already have some nice dishes that they would like to show off to their guests. All you need to do is to install some shelving around your kitchen and place your favourite dishes on them. Make sure that you don’t fill your whole kitchen up with these shelves as you might find that having totally open shelving might make the place look a little too cluttered. You are trying to add glamour, so you need to choose the pieces that are going to stand out on your open shelves. If you want to add a bit more glamour to your kitchen then you are going to need to follow some of the tips that we have given you in this article. You should think about the different parts of your kitchen that you would like to make stand out and you can work from there when it comes to adding new features. If you have a kitchen island, then you should try to make this the focal point of the room. Think about highlighting the island using a beautiful chandelier or even changing the worktop to a sparkly one to make it stand out from the rest. Adding glamour to your kitchen doesn’t have to stop there as you can always change the flooring to make it more aesthetically pleasing without getting rid of the practical elements that a kitchen floor requires. We think that open shelving can work really well if you do it right so make sure not to overload your kitchen with all of your things if you want to keep that glamour. Make sure that you take all of our advice on board in order to make your kitchen as glamorous as possible.